I started the week determined to make good headway on the Yurt book and began by printing out everything that I have written so far. There seemed to be 3 versions of an introduction and several partly completed sections. At least I can now see what needs to be done. I made headway on an article on Shape and Form despite looking up definitions in a dictionary and getting rather muddled. I just decided to write about yurts in general and the structure of mine in particular. I had to put the frame up again in order to make accurate measurements which Bruce in Vermont will need to make the USA frame. My Yurt is not what I would call precision engineered – the measurements vary slightly and seem to change if the grass is bumpy. I need to stand all of the roof spars upside down in a bucket of linseed oil since they seem to be getting brittle at the ends; there have been a few casualties, snapping off at their pointy ends that will need to be replaced. I quilted the panel called Pi Squares with some curving lines and curved cross hatching, filled in with pebbles. The new Elna 740 machine arrived from Pembertons and I put it straight to work on couching some yarn around the circles and defining some of the curves. I am very impressed so far – it has not complained once about chomping through a quilted piece to do a bit of fancy stitching. The larger throat is great for manoeuvring a finished quilt for embellishing since the wadding I have used is rather stiff to make the texture puff up nicely. I painted my bedroom bit by bit during the week. As I have a roll of subtly printed grey and white linen with which I intend to make curtains, I had to cover up the pumpkin coloured walls with something more Scandinavian. I used to paint walls in bold colours but I seem to be choosing paler shades nowadays – I hope it is not a sign of age! I can’t say it was exciting decorating when the colour was an undramatic off-white and by the second coat I couldn’t see where I had been. I finally decided to order a Kitchenaid mixer this week as I came across a very good offer. This promotion did not apply to any of the gorgeously coloured ones so at least I was spared that difficult decision – the classic model only comes in white. This was partly prompted after I grated my thumb amongst the carrots again and I admit that I found the video clip on potato mashing impressive. After working with all of these neutral shades there was some unexpected colour here this week – Fergus discovered a very old bottle of fake tan lotion in the bathroom cupboard and decided to apply it liberally to see whether it would work. The offending bottle had long passed its sell-by date and had a potent smell. Fergus maintained that the bottle “fell” on him. He did not consider rubbing the cream in or washing his hands afterwards so he gradually developed a patchy orange tan that fascinated everyone at school. There has been something wrong with my coffee this week. It seemed to lack flavour so I went on a quest to source some more interesting blends. I researched different types of coffee grinders, wondering if I should make a ritual out of preparing my own beans for elevenses. Ferret had made me a cup of Blue Mountain coffee at the Region 15E weekend that had strength without bitterness. I eventually ordered an extravagant tin direct from Jamaica to see if it really is worth it. I had coffee with Mo midweek and came home with two new hens. She is constantly downsizing her free range flock so we captured a couple using fishing nets and I put them in my empty pigsty. They have laid two eggs each every day while my other lazy four have produced one in total. I had to stock up on layers’ pellets before my trip to Stirling so picked up several new pairs of dressage gloves which are perfect for domestic machine quilting. As well as preparing for a lecture & workshop away from home, helping to make sets of wings for the school show, registering for North East Open Studios and typing away on Yurt related documents, I also began dyeing fabric for the USA Yurt roof. Disappointingly, I realised that I am short by almost 40 metres! This large miscalculation is because I had forgotten that the first roof was tweeds on the top side with dyed backing but the second one will have dyed fabrics on both sides. On a positive note, I experimented and found that one sachet of Hungarian dye will colour an impressive 6 metres at once. I thoroughly enjoyed my trip to Stirling Castle Quilters this week. It only took 2 ½ hours to drive to Stirling which is a compact city and I soon found my way around. The evening talk was held at the very well appointed Raploch Community Campus which had modern conference facilities. It was rather nice not to have to set up the entire yurt as I only took the panels. These were all laid out on tables – there are almost 36 now which is almost enough for two yurts but I aim to complete a minimum of 40 by the summer so that I have “spares” that can be swapped around. I managed to borrow a digital projector so the audience could see pictures of how the frame is constructed. They were really impressed by the scale of the project; they gave me a really very warm welcome and I felt that the talk went down really well. I was told that everyone was looking forward to seeing the fully dressed yurt at the Scottish Regional Day in Perth in September. I pre-quilted a set of 9 Celtic kaleidoscopes for the Stirling workshop and wondered if it would be possible to draw them out instead to save some preparation time. I looked up spiro drawing applications on the computer but it was all a bit mathematical and I couldn’t work out how to echo the lines. I ended up ordering a selection of books on circles, mandalas and vectors as I decided it would be far easier to photocopy, enlarge and trace the patterns. The books that have arrived so far seem to be written for people who have exceptional understanding of geometry and computer programming so I hope that the colouring books that have yet to be delivered will be easier for me to follow. 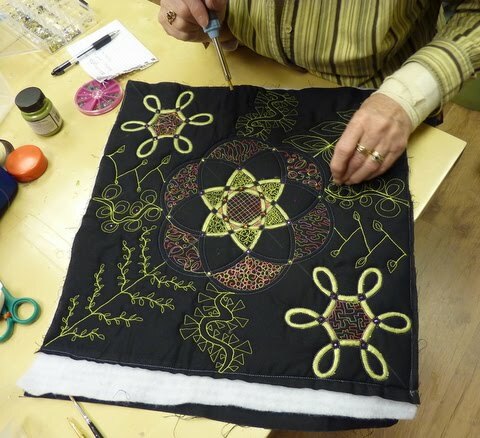 The students in my workshop commented on how fun it was that the basic quilting had already been done so they could concentrate on the more intricate fillers and embellishments. They all worked very hard and produced super pieces which they all seemed to be pleased with! I coerced Freya into helping me rearrange my workshop at the weekend as it seemed to be getting overcrowded and I was climbing around rolls of wadding. It looks much better and I have created enough space to accommodate Lenni, the smaller longarm that I will take to Festival of Quilts. Fenella helped me to clean out a 1950’s kitchen cupboard which most sensible people would have taken to the dump. It is impossible to work out what its original colour may have been and it really could do with a total revamp but I can’t spend days doing it up when I have so many other things to do, including considering repainting my bedroom for the first time in 10 years! Sometimes I have customer quilts that don’t get quilted as soon as they arrive. 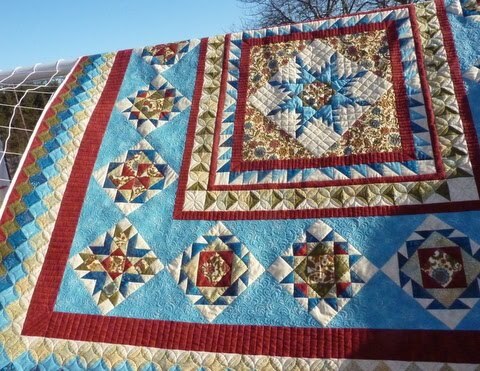 This one came last year as a “no hurry” quilt then its owner eventually took it back to complete herself before returning it recently since it looked rather challenging. This customer makes perfectly pieced quilts and she always warns me not to overdo the fancy quilting. 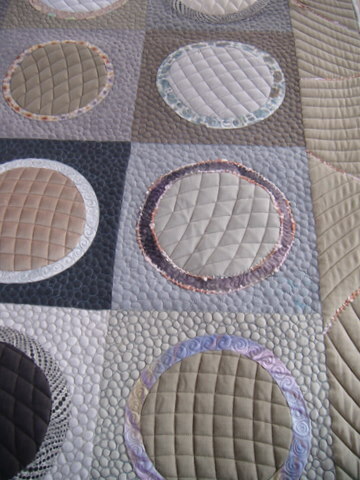 This quilt required formal quilting, particularly stitch in the ditch. I am usually reluctant to use rulers as I once ran over one and had to retime my machine. I think that using rulers on a longarm machine is actually quite tricky to begin with – you certainly have to sew far more slowly and concentrate. It is all a matter of confidence – I used a really small ¼” thick ruler that couldn’t slip for the straight lines and a 2″ circle template for all of the pumpkin seeds. I eventually became faster but it still took me 5 full days of quilting to finish this quilt. I am really pleased with the results and know that I will not be afraid to use rulers again. However, I was conscious of how long it took to be so precise and how I was spending the entire week on just one project. The formal quilt kept me mostly out of mischief. I had coffee with Mo one morning and came home with 2 new laying hens. Mine are lazy layers so I wanted two everyday chooks with no airs and graces. They have already shamed the other lot by laying a brown egg each every day. It was a week of very variable weather – we had gale force winds that threatened to pull off my canvas yurt’s roof. The anchoring straps worked themselves loose so I had to go out and haul them in to avoid a catastrophe. I had planned to drive to Perth for the QGBI Scottish Regional Day but we had a severe weather warning for heavy snowfalls. I spent the spare day usefully catching up on correspondence for the Yurt tour in the USA and browsing for internet special offers on Kitchenaid mixers. It will take me ages to decide whether to buy one as they come in so many lovely colours. I have packed up all of the accessories belonging to my recalcitrant sewing machine to take for a service in case I decide to trade it down. I can only justify doing this if I can get a good deal as it originally cost me a frightening amount of money and I have hardly used any of its fancy functions. I have to pre-quilt some kits for a class that I will be doing for Stirling Castle Quilters this week and maybe I will get started on quilting one of the new Yurt panels. I am dying to get started on Mo’s fabric collage hare but really need to think about how this should be quilted. I also need to decide whether to make something for FOQ this year – if the hare works well then we could consider entering it into the reinstated two-person category. I spent most of the week preparing for my trip to QGBI Region 15E near Durham after getting in touch with Region 15W to apologise profusely for muddling the two groups together and taking the latter out of my diary. Luckily, Ferret has agreed to take my place at their Regional Day in October as I plan to be out of the country. I rooted around my computer to find lots of construction and work-in-progress pictures to make a PowerPoint presentation. This was a really interesting exercise as it meant that I had to create a chronological sequence of photos and make notes. For the first time ever, it made me realise quite how much was involved from planning, to gathering materials, making, enlisting help, putting it all together with the invaluable help from the Stunt Quilters and then starting to work out how to continue developing the project after LLQS. Bizarrely, on the night before the trip, I dreamt about Kitchenaid Mixers rather than having nightmares about driving several hundred miles with a Yurt on the roof of my car. Packing everything up was relatively easy as it was already organised. The tweed roof sections had been packed into vacuum bags which took up very little space. 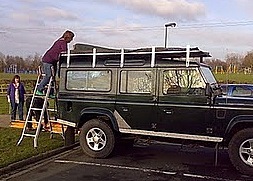 The most challenging thing was working out how to use the ratchets on the roof-rack straps. I think I have it sussed now, after catching a finger in one of them. The 6 hour journey was pretty smooth all the way to Newcastle then a couple of angry motorists shook their fists at me while meant to be keeping to the 40mph speed limit during roadworks as they wanted to overtake. I almost made it to my final destination then had a last minute doubt that I was in the right place so stopped at a corner shop to ask for directions. In my haste to get away, I backed up the Landy but somehow just did not see a parked car behind as I crunched its plastic bumper. The driver emerged from the shop, understandably annoyed and I apologised profusely while also getting lip from some cheeky teenaged bystanders. I was SO annoyed with myself! There wasn’t a scratch on the Landy, of course. During the evening some of the Region 15E committee members gathered and finally after 10pm we gained access to the venue. The janitor was most concerned about his newly varnished floor but we were very careful. Miraculously, the small team of ladies managed to put up the wooden frame within an hour but it made me realise that however independent I claim to be, this is one job where Manpower is essential. We arrived early the next morning to hang the wall panels and get the huge tweed roof up. Despite not having time to hang bunting and fairy lights on the Yurt, it was great to see it in all of its finery again. The visitors were impressed and seemed to enjoy my talk which actually overran a little. I normally worry that I will be over concise and finish talking too soon. I received many compliments and admiration for my crazy project, and for the amazing support of the Stunt Quilters. I was delighted to sell some of my hand-dyed packs and postcards. I even met 2 longarmers who were keen to undertake some tuition and it was really nice that Kath from Darlington came specially – she even volunteered her son to help pack up the Landy afterwards, which was hugely appreciated. It was fun to meet up with Ferret again as we always seem to get along rather well. We were amused that some members of the audience didn’t know which of us was which and wondered vaguely whether we should plan a joint road trip in the future. Her talk also went down very well and it looked like everyone managed to stay awake all day – this has not always been the case at other Regional days that I have attended as there often seems to be some surreptitious afternoon snoozing going on. I must thank Ann for being a lovely hostess and looking after me this weekend and I thoroughly enjoyed meeting quilters from another area. It was a long drive home but I was able to listen to Radio 4 for most of the way. I stopped at IKEA for lunch on the way home and bought a bolt of black cotton which I daresay wiped out the modest profit that I might have made if I had not ruined someone’s bumper. Unfortunately I didn’t remember to ask anyone to take photos on my own camera so I hope that someone might send me a picture or two. I believe that Ferret may have taken a quick snap as I climbed on the Landy to load up my floral trimmed army canvas roof-rack bag – I don’t suppose it was a particularly flattering shot!